A blogger I follow, A Geek Girl’s Guide, recently did a gamer tag event on her blog encouraging folks to talk about video games that they play. I read the posts with some interest, but being more of a tabletop gamer I didn’t really participate. Now, she has done the Tabletop Tag (click on the hyperlink to view hers). So, here is my contribution to the blogosphere. Character focused adventure games. This incorporates roleplay games, and boardgames that are the spiritual descendants of Heroquest. If you want to know why Heroquest is the best game ever, you can check out Bardic Broadcast’s video on the subject. Weekends. Many of the games I own take a long to play and the weekend is often the only viable option. I am going to cheat and pick 3 as they are all slightly different. Vampire: the Dark Ages is by far my favourite roleplay game (It is the companion game to Vampire: The Masquerade which is set in modern day). It is part of the World of Darkness line of games, including Mage: the Ascension, Werewolf: the Apocalypse, Hunter: the Reckoning and Changeling: the Dreaming. All of these games interlock perfectly, not necessarily in a balanced way (a starter werewolf will rip apart a pack of starter vampires without any trouble, for instance), and create a very lore rich world to play in. I have been playing this game on and off for 20 years, and still I am learning stuff about the background. It even prompts research on my part to understand the philosophies that characters within the game hold. (I was researching the relationship between the Egyptian God Set and the Greek monster Typhon at the weekend, for example). The character creation system for players has much more freedom for the players than some Dungeons & Dragons variants (In D&D there is a random element thrown in at character creation, relating to background in some systems. I am less keen on that for a long campaign game), should they be feeling creative. I regularly update a serial, based on this game, on this blog called “The Mycroft Journals“. The first three sections for that were written up as character background because I really wanted to get invested. One of the aforementioned spiritual successors to Heroquest, and my personal favourite, is Descent: Journeys in the Dark. Descent is an asymmetric game where one player takes the role of Evil Overlord (usually me), and the remaining players (Up to 4) are heroes. There are standalone adventures available to play, and you can design your own through Fantasy Flight Games Quest Vault tool, as well as campaigns intended to run over multiple sessions. I am in the process of designing a standalone adventure about a village under threat from a witch. In many ways, Descent is a better game than Heroquest, as it functions very much like Dungeons & Dragons light. Players choose their character (There are 8 in the core set, and dozens others in expansions), each having unique abilities, and then they pick their class. So, there are different kinds of fighters, scouts, healers and mages available to choose from. Each players gets some starting gear and abilities and the overlord sets up the map. Players have to achieve a specified objective, which might be “Defeat a specific monster”, “Find an item”, or “Rescue civilians from danger”. I am being quite generic there. This game has so many expansions, so many monsters, the replayability of an already fun game is enormous. My friends and I have completed one campaign, the Shadows of Nerekhall. The campaign was incredibly fun, with the Overlord winning most quests, however, the Heroes upped their game and salvaged ultimate victory. I had so much fun, it didn’t matter that the players won. Twilight Imperium is one of the most vast games I have ever played, the focus shifting away from playing a character to that of playing a space empire looking to dominate its neighbours. Twilight Imperium plays very much like a Sid Meier video game starting you off controlling one star system, with a small fleet and one piece of technology. Each player picks a random faction from those available, all of which have different strengths, and then draws objectives. Each turn, players choose strategy cards, which are grand scale things that might help them during the tactical phase. Strategies could be to initiate trade with other empires, throw resources into research and development, throw resources into warship construction or even call the Galactic Senate to order on the intergalactic capital, Mecatol Rex. There are a lot of things in this game that look like other Sci-Fi things, such as Mecatol Rex reminds me of Coruscant in Starwars. The Warsuns, the largest ships you can build, look a lot like Death Stars. The starmap is constructed for each game randomly, so with random maps, random factions and differing objectives, you never get the exact same game. Play continues until one player gets 12 victory points. Vampire: The Dark Ages. I fought demon dogs. Thinking on it, they might actually have been Typhonic Beasts, going by their description. Which means, two things. 1. I was right about why the Prince in the game acts the way he does. and 2. We’re in trouble. Probably Vampire, by virtue of the fact it has been around since the 90s. I frequently also play Roll for the Galaxy, and Marvel Legendary. 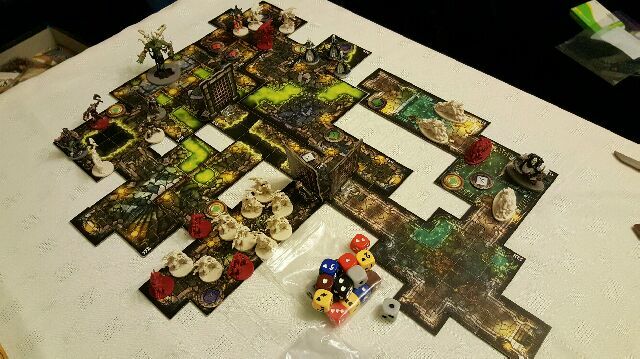 Descent got a lot of play when we were running the campaign. Sadly, Twilight Imperium is usually too heavy a time commitment to get regular play. Vampire Hunters. I was a late pledge to their Kickstarter, hopefully it will arrive in July as advertised. It appears to have a similar play mechanic to Descent, however the setting is more in line with Vampire Hunting, and the Vampires have variable power depending on whether it is Day or Night. Marvel Legendary. It is fairly straightforward, and cooperative so it helps ease in a new player. Roll for the Galaxy is also a lot of fun, and plays quickly, however people tend to panic when I try and explain the rules as they sound really complex. (They aren’t, most people get it after a brief explanation, and then playing for ten minutes). I can’t think of a well known game I haven’t played. I only ever played Settlers of Catan once, and never tried it again as I found it boring. My Game Shelf Last Summer. So, that is my Tabletop Tag. If you are interested in doing one, then simply answer the following questions. Perhaps you will be less long-winded than I. The only tabletop game I’ve ever really gotten into is Munchkin, and I know that’s much less in-depth than those you mentioned! I’ve always been interested in Dungeons & Dragons, so Descent sounds like it would be a lot of fun to try out. The artwork for Vampire Hunters looks gorgeous, glad to see they surpassed their Kickstarter goal! Kickstarter is so great for funding board games! I usually will browse campaigns and fund anything that I’m interested in. I plan on getting my tag up soon!